Time was, when folks would start thinking about Hallowe’en the day before. Yes, you’d have your mask and your candle. No point in letting vengeful spirits trapped between life and death recognise you. But that’s where it ended. These days the Hallowe’en business is booming. In our local supermarket plastic pumpkins and gummy ghoulish candy have already been in evidence for weeks. Recession bites, and the salesmen get to work haunting our existences with bloodshot eyeballs aimed at our wallets. I refuse to comply: except that last weekend, I forgot to refuse to comply, and coughed up about one pound for a pair of rather dapper skeleton biscuits. Perfect for fitting in a child’s palm, they were dark firm gingerbread, overlaid with a white skeleton design of considerable style and panache. One had red eyes, the other white. They grinned, just as skulls have grinned every October in English gloom since at least the sixteenth century. I bore them home for tea. Maddie ate hers up, enjoying every last crumb: but Felix is like my brother used to be, one of those infernal hoarders, who always seems to be the one left with the sweetmeat when everyone else has despatched theirs. He ate half his skeleton biscuit. The one with the red eyes. And then he wrapped it carefully up, and he left it on the working surface. Now what you must understand about this working surface, before we go any further, is that it is next to the radio and the random post pile and the bots and bobs. One’s eyes fall naturally there to check for anything to one’s advantage. It is on the main thoroughfare into the food hall. Even the dog knows that stuff left there is possibly tasty and up for grabs. And there sat the skeleton, without its legs, but otherwise retaining every ounce of its magnetic sugary charm. And each of us walked past. Lots of times. Felix did not finish it on Sunday. Instead he announced that he was going to nibble more of it. Which he did. Gingerbread skeleton was looking more depleted, but there was still much more left. I had walked past that skeleton for more than 48 hours when I finally went over the edge. Grabbing the wrapping, I took him out, telling myself, with that irrational voice I always maintain is the voice of my stomach, that Felix would never notice. A word of advice: your stomach is not a logical organ. It does not have to live in the real world like the rest of you. It will tell you anything to get what it wants. I gobbled the arms greedily. 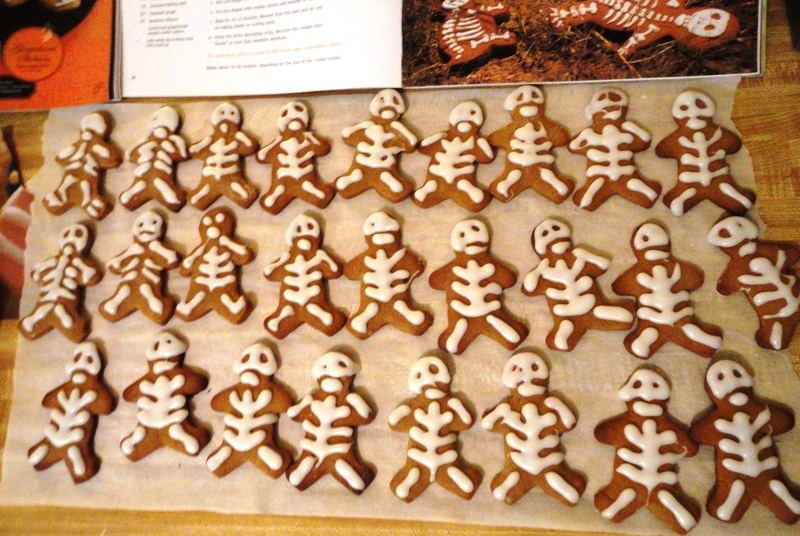 Her Majesty’s Inspectorate of Skeleton Gingerbread Men strolled into the kitchen. I broke down before the interrogation began. I ate the arms, your honour, I confessed to a frankly disgusted son. And still, he did not take the hint. Still, he left those hypnotic red-icing eyes to lure unsuspecting passers-by to their patisserie of doom. Tonight, Felix pottered over to inspect his skelton and have another nibble. By now, the whole household was a little infuriated. But nothing prepared us for his findings. For all but that head was vanished without a trace. Detective work revealed that Felix’s father had been unable to take the skeleton pledge. He had gobbled its rib cage and what I had left of its limbs. Felix was outraged. He was characteristically vocal. Felix knows when to keep quiet. And very soon, if my husband has his way, the whole sorry gingerbread pantomime will be upon us again. I think perhaps this time: we should have a box of the boney gentlemen. Photo – and the most lovely recipe for gingerbread skeletons which I think I had better now try – at Try It You Might Like It. Posted in Shrewsday MansionsTagged biscuits, family, Hallowe'en, humor, humour, skeletonsBookmark the permalink. I can’t believe you stole prized skeleton biscuit limbs from your own son. Has child protective services been notified? 😀 I’m going to turn myself in, Antonia. The grim shame of it has become too much for me. Do to also eat the rabbit ears at Easter time :-). Sit on the boy until he has finished every last crumb. Quite. None of this stringing special biscuits over days. I think Felix was just stringing you all along so he could get another gingerbread skeleton. Smart boy. I see one oddball guy in there. Non conformity in the cookie world? The skeleton which walks to the beat of his own drum…. This is just sooooo funny; first, that Felix strings the yummies along for such a time and then the rest of the household actually goes along with it….to a point. I am incredulous that Master Mac did not seize the situation and make all of yours and Phil’s filching moot. How anyone could pass up eating an enticing sugary treat in one swoop is beyond me, that little gingerbread guy would have been gone in a dash in this household. Mac has been very controlled, Lou, it is true. Credit where credit is due. My sympathies lie completely with the illegal gobblers. One of my cousins used to still be nibbling on her Easter egg stash when the following Easter was almost upon us – used to drive us all crazy! My Felix is also a hoarder of sweets. He is still working through last Halloween’s haul, one or two M&Ms at a time. Who can DO that? It’s unnatural. This is hilarious! I sometimes wish I could “hoard” my sweets…once in my sight, they’re done for. But the picture of his parents taking nibbles from the prized fruit…that’s too funny! I’m going to make those cute little skeletons and it seems to me there will be enough to satisfy as well as share. Does Felix feel like baking? He can sometimes be persuaded, Debra, and this is a prime occasion, I feel! He is courageous in that sort of situation, Carrie. Lamentably. Oh, what a fun story of gingery delight, Kate. Felix is a prince of a lad who has more self control than, well, than his family. tee hee My Tom will horde like that. I once baked him a Boston Cream pie, in February, when we were in college. He kept it in his car so he didn’t have to share it with his roommates and would sit in it, eating it a piece at a time. I find those skeletons rather disconcerting. They have their rib cages on upside down…. I suggest you tell Felix to hide the skeleton – I’m sure he can find a suitable ‘coffin’ until he feels the need to nibble. Then it would be out of sight and out of mind for you? Coffin. Now why didn’t I think of that? You are a master in Son Management. Kate ~ I think the Shrewsday clan should make Gingerbread Skeletons, Coffins, Pumpkins, and Bats for the All Hallow’s Eve. We have Christmas crap out everywhere over here. I would love a skeleton cookie. Felix is like MTM. He is patient and can savor something. He buys new clothes or shoes and takes months to wear them, while I wear a brand new thing off-season because it is new. Perhaps he will hide the gingerbread in his room next time. Under his pillow for a midnight snack. At least that would have a little subtlety about it, Andra. The corner of the surface in the kitchen is as busy as Clapham Junction. So funny – seems like Felix should find a safer storage place. Thanks for the recipe link – I am going to try it out! You and me both, Patti! I love Halloween, Kate. All of October is Halloween for me! Great post–hilarious! How dare you! Damn. Blame it on the dog. Or the cat. Now why didn’t I think of that, Judy? Kinda partial to the third one in bottom left. He seems to have something going that is different than the rest. I was a kid like Felix. My siblings would gobble their treats at warpspeed, but I’d hoard and wait. I also had an ethical problem with eating my Easter bunnies. This drove my siblings over the edge. Those iced gingerbread skeletons look delicious! Thanks for sharing the link to the recipe, not that I’m inclined to bake. I am sure the streets of New York have many bakeries which will proffer iced skeletons, Lame. Bake, schmake. I used to LOVE Halloween, before it became so commercialized. It was a holiday with no rules. You didn’t have to visit relatives. You didn’t have to wear white, You could be anything you wanted and got treats for it. So of course you should let your inner rebel out and snitch skeleton parts. Your only sin was not buying (or making) more. Enjoy your haunted happiness. Thanks, Barb. I shall invest in more and enjoy the holiday to the full! ha ha 😀 just can’t stop laughing…. I hope you make up for your stomach’s outings to Felix. I laughed out loud at “Her Majesty’s Inspectorate of Skeleton Gingerbread Men.” And thanks for sharing the link to the recipe! Pleasure. needless to say, I shall be making several myself, Weebles. Ha! I am amazed the dog did not take matters into his own hand, PT!